I am so excited about today's a small chat interview with insanely talented Viv of ish and chi. She makes original fabric artwork (see her etsy shop here) and is an all-around creative person, showcasing her design inspirations on her lovely blog. Sharing her love of design plus tours of her own space (you have to go see!! ), Viv's space is cheery, super stylish yet completely comfy. Yes! Let's hear what she has to say about small space dwelling. You live in a cottage-style house (it's so lovely!) and are passionate about decorating and design. How did you design your space while keeping your creative design style in tact while utilizing the best use of the space? Thank you! My husband and I had a lot of the interior stripped out including the old canary yellow kitchen, built-in wall-to-wall cupboard in the living and built-in study desks in each bedroom. Along with a structural change, opening a wall leading into the kitchen, we were left with a great blank canvas to work with, much more space and a better 'flow' in the house. From there it was a matter of keeping the interior simple, white and bright and hoping our existing furniture fit! I always knew we could add colour later with accessories and other accents. I wasn't in a hurry to finish each room and over time it is slowly evolving and changing. You create handmade fabrics and artwork and sell them in your Etsy shop, Ish and Chi. They are colorful, vibrant and graphic. How do you feel color works best in small spaces? How have you integrated color into your home while keeping the smaller space feeling open? I try to either have one stand-out colourful piece in a room (for example the artwork in the study) and to keep the rest of the room neutral/white or to have a grouping of colourful pieces (for example the wallpaper frames in the bedroom). Whenever I try adding any more colour to a room I end up pairing back because, for me, it feels too much. I see in your shelves off your kitchen, you used a wallpaper accent to give color and dimension (one of my fave uses for wallpaper is just this!) What are your favorite tips for adding accents to small spaces without breaking the bank? Use wallpaper off-cuts if they are available for purchase. The wallpaper I used in the kitchen is usually $350 for a 10m roll. I bought 2 rolls of offcuts, enough for this cabinet, for $80. Also lately I have been buying wallpaper from ebay which is very cheap! 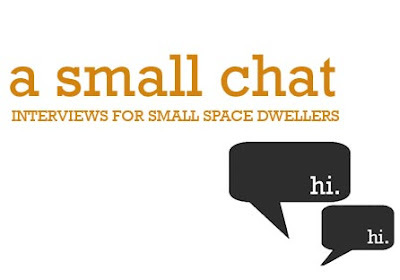 Small space dwellers often use the same room for a few functions. Your dining/living room makeover really opened up the space - it's much bigger and it's gorgeous! What was your main goal for this space and how did you concept the open floor plan? Because the house didn't have a dining room it was a matter of either ditching the 8-seat dining table we already owned for a small table that fit 2 people (as the previous owners had) or try to make it work in this combined space. Removing the build-in cabinet in the living room gave us more floor space and we were lucky that the furniture fit (just). The original plan was to swap the dining and living room furniture around but, even though I had measured the floor space and drawn up a plan, we found that we didn't have as much room to move through the space and into the kitchen so we switched the furniture around to where it is now. Opening the wall between the kitchen and living/dining was the best decision we made. It really opened up the space. What I love most about it is that if we have guests over, I can prepare coffees etc and not feel as though I am missing out of conversations. Thanks, Viv!! Click here to enjoy the ish and chi blog and click here to support and buy up all of Viv's etsy goods.